12652. Phyllis Jean TRAUTMAN (Ilene Elizabeth MANHART , Byron Stanley MANHART , Sarah Jane STOCKER , Catherine Christiana YETTER , Sarah BITLER , Michael , Johannes ). Phyllis married Joseph CHOPEK, son of Joseph CHOPEK and Mary FEDUNIK. Joseph was born on 17 Oct 1926 in Akron, Summit Co, OH. He died on 11 Oct 1995 in Akron, Summit Co, OH. He was buried in Greenwood Cemetery, Mogadore, Summit Co, OH. Joseph resides in Mogadore, Summit Co, OH. He served in the military with U.S. Army from 18 Dec 1944 to 25 Nov 1946 in WW II. He was issued a social security number before 1951 in OH. He worked with Canteen Co. (19 yrs). He worked with Ohio Fabricators (18 yrs). + 18058 F i Becky Lynn CHOPEK. + 18059 F ii Linda M CHOPEK. + 18060 F iii Denise G CHOPEK. + 18061 F iv Teresa CHOPEK. + 18062 F v Merrie E CHOPEK. Phyllis also married Francis G MYERS "Frank". 12653. Barbara Anne TRAUTMAN (Ilene Elizabeth MANHART , Byron Stanley MANHART , Sarah Jane STOCKER , Catherine Christiana YETTER , Sarah BITLER , Michael , Johannes ). Barbara married Charles Albert MITCHELL. 18063 F i Cindy MITCHELL. 18064 M ii Charles MITCHELL. 18065 F iii Debbie MITCHELL. 18066 F iv Julie MITCHELL. 12654. Evelyn May TRAUTMAN [scrapbook] 1, 2, 3, 4, 5 (Ilene Elizabeth MANHART , Byron Stanley MANHART , Sarah Jane STOCKER , Catherine Christiana YETTER , Sarah BITLER , Michael , Johannes ) was born on 16 May 1938 in Akron, Summit Co, OH. She died on 24 Feb 1989 in Aultman Hospital, Canton, Stark Co, OH. She was buried in Sunset Hills Memory Gardens, North Canton, Stark Co, OH. 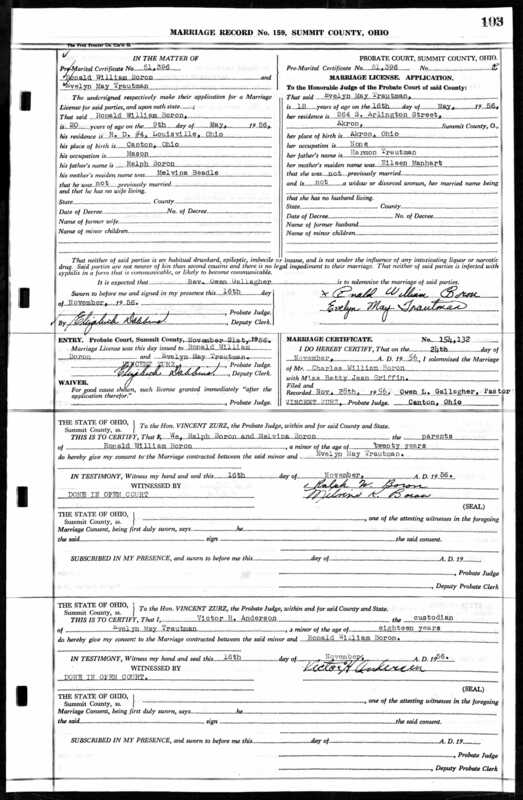 Evelyn was issued a social security number in 1955 in OH. She resided in Nov 1956 in 264 S Arlington St, Akron, Summit Co, OH. Evelyn married Ronald William BORON [scrapbook] 1, 2, 3, 4, son of Ralph BORON and Melvina BEADLE, on 24 Nov 1956 in Summit Co, OH. Ronald was born on 9 May 1936 in Canton, Stark Co, OH. He died on 11 Nov 1972 in Canton, Stark Co, OH. He was buried in Saint Robert Sec Row 1, Saint Louis Cemetery, Louisville, Stark Co, OH. Ronald was issued a social security number in 1953/1954 in OH. He resided in Nov 1956 in RD 4 Louisville, OH. He worked as mason in Nov 1956. 18067 M i Blaine M BORON. Blaine married Sandra THOMAS "Sandy". + 18068 F ii Kathryn R "Kathy" BORON. Dean E BORON 1, 2 was born on 3 Nov 1959 in Canton, Stark Co, OH. He died on 29 Dec 2016 in Canton, Stark Co, OH. Dean resided in Canton, Stark Co, OH. 18070 M iv Raymond W "Ray" BORON. Ray married Christi A ONSPAUGH. 18071 M v Sean W BORON. Evelyn also married Rickey E PETREE "Rick" on 6 Apr 1974 in Stark Co, OH. 18072 F vi Kelly PETREE. 12655. Carl R TRAUTMAN (Ilene Elizabeth MANHART , Byron Stanley MANHART , Sarah Jane STOCKER , Catherine Christiana YETTER , Sarah BITLER , Michael , Johannes ). Carl married Becky L HAWK. + 18073 F i Carrie R TRAUTMAN. + 18074 M ii Brian Lewis TRAUTMAN. + 18075 M iii Kevin A TRAUTMAN. + 18076 F iv Adriane Lynn TRAUTMAN. 12656. Janet Kay TRAUTMAN [scrapbook] 1, 2 (Ilene Elizabeth MANHART , Byron Stanley MANHART , Sarah Jane STOCKER , Catherine Christiana YETTER , Sarah BITLER , Michael , Johannes ) was born on 12 Jun 1945 in OH. She died on 31 Jan 1981 in Akron, Summit Co, OH. She was buried on 3 Feb 1981 in Greenwood Cemetery, Mogadore, Summit Co, OH. Janet was issued a social security number in 1961/1962 in OH. She graduated from Washington High School in 1963. She worked with Sugar Bowl until 1965. She resided in 1965 in Ravenna, Fairfield Co, OH. She worked as waitress. She was a member of St. Matthew Roman Catholic Church. Janet married Louis Michael WOJCINSKI II on 10 Jul 1965 in St. Mary's Catholic Church, Massillon, OH. 18077 M i Louis M WOJCINSKI. 18078 F ii Elizabeth "Beth Ann" WOJCINSKI. Beth Ann married Curtis Alyssa PENNINGTON "Mick". 18079 M iii Anthony John WOJCINSKI. 18080 M iv Andrew WOJCINSKI. 12657. Linda J TRAUTMAN (Ilene Elizabeth MANHART , Byron Stanley MANHART , Sarah Jane STOCKER , Catherine Christiana YETTER , Sarah BITLER , Michael , Johannes ). Linda married Robert Edward BODIS "Bob". 18081 F i Susan M BODIS. 18082 M ii Christopher J BODIS. Christopher married Jennifer Ann HARTY. 18083 F iii [Female] BODIS. 18084 M iv [Male] BODIS. 12660. Tina Lynne ANKENY (Jane R MANHART , Byron Stanley MANHART , Sarah Jane STOCKER , Catherine Christiana YETTER , Sarah BITLER , Michael , Johannes ). Tina married Paul Henry HERSHBERGER. 18085 M i Brian K HERSHBERGER. Brian married Kelly N HEFFELFINGER. 12661. Stanley Bernard MANHART (Stanley Rex MANHART , Byron Stanley MANHART , Sarah Jane STOCKER , Catherine Christiana YETTER , Sarah BITLER , Michael , Johannes ). Stanley married Constance Marie LOCKARD. 18086 M i Stanley Robert MANHART. 12662. Rex Douglas MANHART (Stanley Rex MANHART , Byron Stanley MANHART , Sarah Jane STOCKER , Catherine Christiana YETTER , Sarah BITLER , Michael , Johannes ). Rex married Bonnie Gay GILBERT [scrapbook], daughter of Raymond Ray GILBERT and Mabel Neomi HURD. The marriage ended in divorce. Bonnie was born on 13 Jan 1956 in Akron, Summit Co, OH. She died on 21 Jan 2006. She was buried in Hillside Memorial Park, Akron, Summit Co, OH. Bonnie resides in Jun 1974 in 1769 Clayben Dr, Akron, Summit Co, OH. She worked as none in Jun 1974. 18087 M i Douglas MANHART. 18088 F ii Carrie MANHART. 12663. Susan Cherie MANHART (Stanley Rex MANHART , Byron Stanley MANHART , Sarah Jane STOCKER , Catherine Christiana YETTER , Sarah BITLER , Michael , Johannes ). 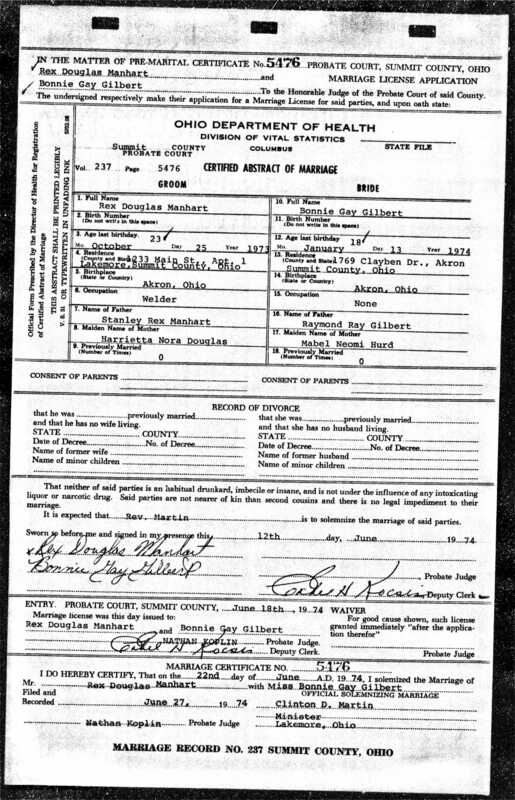 Susan married Larry Joseph PORTMANN. Susan also married Thomas L TUSTIN. 12673. Toni MARKO (Carolyn Mae MANHART , Byron Stanley MANHART , Sarah Jane STOCKER , Catherine Christiana YETTER , Sarah BITLER , Michael , Johannes ). 18092 M i Frank KREMER Jr.
12679. Barbara Jean FINCHER (Harry FINCHER , William Penn FINCHER , Able Thomas FINCHER , Susanah YETTER , Sarah BITLER , Michael , Johannes ). Barbara married Robert Galvan COBRAL. 18093 F i Deborah Ann COBRAL. 18094 F ii Cherise Suzanna COBRAL. 18095 M iii Robert Christopher COBRAL. Barbara also married Rip Ronnie MASELLI.